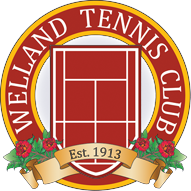 The Welland Tennis Club offers a wide variety of options for tennis lessons based on age and skill level. If you have any questions please don’t hesitate to contact the tennis club at (905) 788 – 1066 and speak with the Club Pro. We are happy to accommodate your family summer vacation schedule if it happens to conflict with part of our tennis lesson schedule. Tuesdays 4 - 5p.m. and Saturdays 9 - 10a..m.
Tuesdays 5 - 6p.m. and Saturdays 10 - 11a.m. Tuesdays 6 - 7p.m. and Saturdays 11a.m. - 12p.m. Wednesdays 5 - 6:30p.m. and Fridays 4:30 - 6p.m. Thursdays from 7 - 8:30p.m. Mondays 4 - 5:30p.m. and Thursdays from 4 - 5:30p.m. Mondays 5:30 - 7p.m. and Thursdays 5:30 - 7p.m.